In the latest edition, augmented reality has a plethora of conferences to attend. Remember that mixed reality Easter egg hunt we talked about last month? The hunt was officially on last weekend at VRLA, held at the Los Angeles Convention Center. Built by AfterNow and Flarb, attendees explored a room decorated as a cartoonish forest, where they frolicked with woodland creature animations and located virtual eggs. The attraction appeared to be popular with conference attendees. Ralph Barbagallo, founder of Flarb, noted on Twitter that the wait was as long as three hours on Sunday. Barbagallo also shared a short clip of the experience from within HoloLens. NASA, Ford, Delta Airlines, and Super Ventures are among the featured presenters at Consumer VR 2017, Canada's largest augmented/virtual reality conference, scheduled to take place May 5–7 in the West Exhibition Hall A at the Vancouver Convention Centre. "This really is a collection of the best and the brightest products in virtual, augmented and mixed reality — all under one roof. CVR is the biggest AR/VR conference in the Pacific Northwest and it will allow the general public to try out the newest, cutting-edge products right here in Vancouver," said Anne-Marie Enns, Executive Producer of CVR, via a press release. The conference is open to industry professionals only on May 5; the general public is invited for the remainder of the dates. For tickets and additional information, visit the conference website. The second annual Exponential Manufacturing Summit taking place in Boston next month will examine disruptive technologies, including how augmented/virtual reality and other digital technology will change retail supply chains. Hosted by Singularity University (SU), the conference will take place May 17–19 at the Westin Waterfront Hotel. Guest speakers at the conference include representatives from Google, the White House Office of Science and Technology Policy, Dell, Reebok, and Autodesk, among others. "This year we'll share SU's unique insight on recent advances in exponential and converging technologies, but we'll also go deeper than ever before into how these technologies are affecting specific manufacturing functions and the strategic decisions leaders will need to be prepared to make right now," said Will Weisman, Executive Director, Summits, in a press release. The Society for Information Display (SID) will focus on augmented and virtual reality with a one-day AR/VR Market Conference on May 24 at the Los Angeles Convention Center. Taking place during their annual Display Week exhibition, SID, in partnership with Display Supply Chain Consultants, the OLED Association, and Veritas et Visus, will host exhibitors and presentations examining business and technical issues regarding display technology for AR and VR devices. Starting at 0:44 in the video below, Sri Peruvemba, CEO at Marketer International and SID Marketing Chair, talks about what the display industry can expect for augmented and virtual reality in the near future. Specifically, he notes that high-resolution displays are expected to be built specifically for headsets, as opposed to existing displays repurposed for AR/VR applications. "SID's premier Display Week is the ideal gathering for display experts, consumer electronics companies, integrators and general enthusiasts to all come together to look beyond the chatter and hype and really delve into what's needed for these technologies to build the ecosystem necessary to realize widespread acceptance and adoption," said Sri Peruvemba, SID Marketing Chair, in a press release. For more information on Display Week 2017, visit displayweek.org. 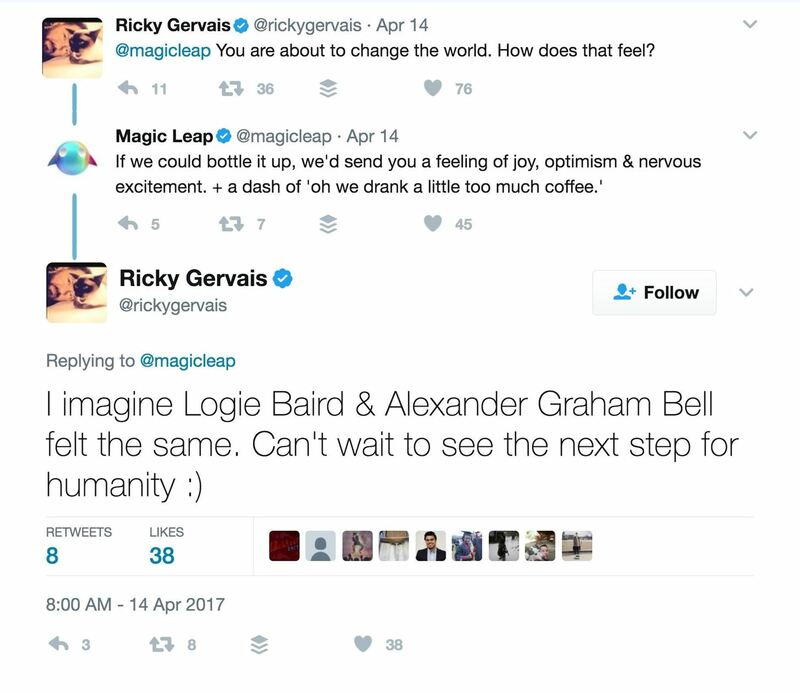 After NBA star Andre Iguodala made headlines last week about his experience previewing Magic Leap, actor/comedian Ricky Gervais has joined him in praise of the next-generation mixed reality platform. Via Twitter this past weekend, Gervais heaped praise on the company for its innovation. The rest of us will have to be patient. 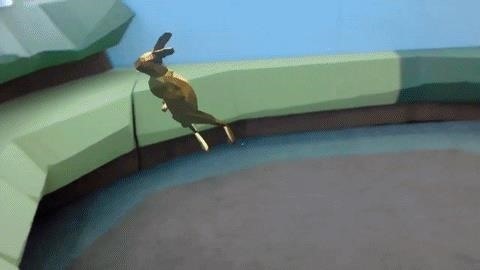 In a response to Bryan Crow, CTO of WonderHowTo (Next Reality's parent), Magic Leap founder and CEO Rony Abovitz reiterated that the company is working with select creators and developers at the moment, adding that "we will expand the circle throughout the year." Not every celebrity is jumping on the Magic Leap bandwagon just yet. Reportedly, modern diva Beyonce has also previewed the technology with a tepid response.